Snowbee Geo Nano Technology Fly Rods has been the big news in fly rod development. However, a number of brands have 'jumped on the bandwagon', offering what is purported to be 'nano technology', at very low prices. Beware, true Nano Resin Technology does not come cheap and Snowbees design team has been searching for the most advanced nano technology at the right price… and now they've found it! Snowbee New carbon fibre 'pre-preg' materials utilise the very latest Japanese nano resin technology, using a unique SiC Reinforced Resin System. Lab tests prove that the flexural strength and modulus of Snowbee new SiC reinforced resin system are circa 11% stronger than those of typical, standard resin systems. We have heard of SiC being used for lining stripper rings, but this innovative use of Silicon Carbide to reinforce resin, results in fly rod blanks which are lighter, crisper and a faster action than previously achievable and a blank that is as close to 'unbreakable' in normal use, as it is possible to get. Built to Snowbee exacting standards and incorporation Snowbee time-proven 'Tri-Modulus technology', where modulus carbon fibres are used throughout the length of the blank to achieve the exact action required. 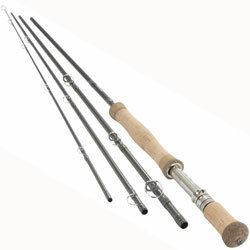 Also fitted with the very latest, lightweight aluminium reel seats from ALPS, with carbon fibre inserts for weight reduction, these high-tech rods really are at the cutting-edge of fly rod development. Snowbee Geo Nano Fly Rod 9' #10 aimed squarely at the saltwater or predator fly fisher, this model features Snowbee's double stripper rings, first introduced on the Deep Blue Saltwater fly rods, the advantage is this provides better line control and 'tames' the coils in fly lines faster, when shooting, giving effortless increased distance. Powerful blanks that will find favour with both saltwater or pike anglers.